Book online to enjoy rates as low as THB995 (USD30) at the family-friendly All Seasons Bangkok Siam Hotel. The quoted price is for a Standard Room furnished with two twin beds or one double bed and includes breakfast for two people. A 10% service charge and 7% local taxes are additional. These rates are available on select dates now through August 31, 2012. ‘Hot Deals’ rates are also available for a Superior Room starting from THB1,150 (USD37) per night or a Junior Suite from THB1,580 (USD51) per night. These rates require full pre-payment by credit card and no changes or cancellations are permitted. The All Seasons Bangkok Siam is a family-friendly budget hotel located in central Bangkok. The hotel offers 177 guestrooms with a contemporary design and modern amenities like satellite TV and WiFi internet access. 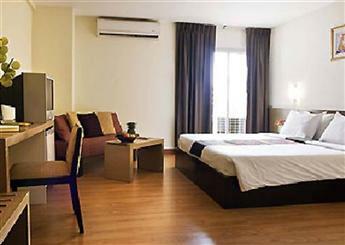 Hotel facilities include a restaurant, tour desk, and business center. Visit the official All Seasons Bangkok Siam Hotel website for more information or to make an online booking. The hotel can be contacted by calling (66) 2 2093888 or emailing reservation@allseasons-siam.com.